(1) By taxi: You can get a taxi right outside the arrival terminals. It is about 40 km from the airport to the Chang-Feng Holiday inn or the IHEP Guest House. The fare is about 22USD. If you take the Taxi to the Hotel, please show the following tag ① or ② to the taxi driver. (2) By Subway: You can take Beijing Subway from the Airport Station to Dongzhimen Station, from which transfer to line 2. Then make another change from line 2 to line 1 at Jianguomen Station, Take the direction to Ping Guo Yuan and stop off at Yuquanlu Station. 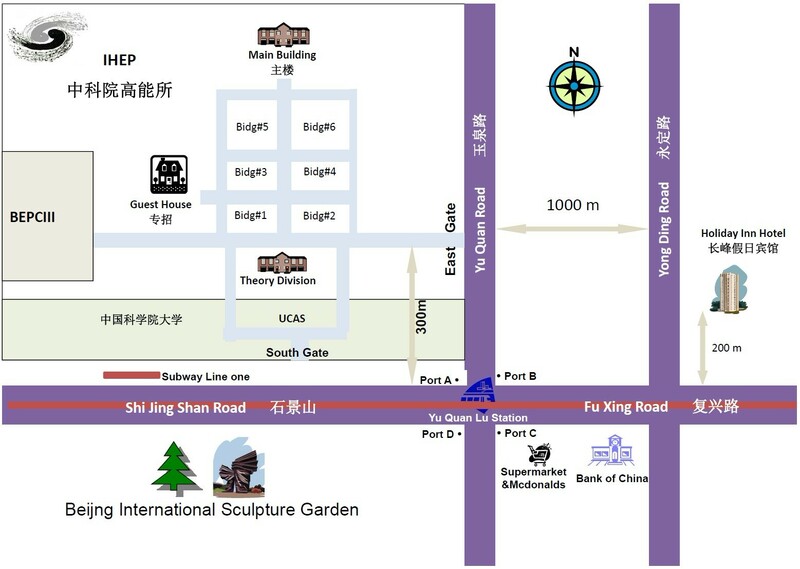 Take the north-west exit (Port A) and the IHEP campus is just at the north-west corner of the traffic cross. You can take the southern gate ( 300m west to the Subway Port A)[map]. (3) Airport shuttle bus: You also can take airport shuttle bus from the airport to the Gong Zhu Fen bus station. The fare is 16RMB (2.4USD). Then you can take taxi to the Hotel or the Guest House. The fare is about 25RMB (3.5 USD). If you take the airport shuttle bus to Gong Zhu Fen, please show the following tag ③ to the check-in staff. 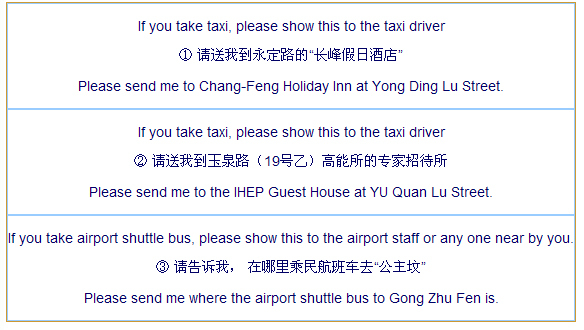 When you arrive to Gong Zhu Fen, you need to take a taxi to the Hotel, please show the tag ① or ② to the taxi driver.